"Thirty three years ago I had my dream dress design picked out and excitedly ventured into the city to purchase the material. Along with my Aunty—my dressmaker—we purchased superb white satin, chiffon, 45 metres of sunray pleated frill and 3 metres of exquisite ‘Brussels Lace’ made in Belgium. $350 worth of beautiful material—which was a lot of money back in 1981. The dress was made after many hours of sewing and hand stitching of the intricate pattern and placing of the lace on the dress. On the 15th August 1981, I wore my dream dress, it looked magnificent and I felt like a Princess. Over all the years gone by I looked after the gown, wrapping it up in dark blue tissue paper and then placed it into my camphor wood chest. After all, this was a family heirloom made by my dear Aunt, even if I never thought in my wildest dreams it would be worn again. There it remained until my eldest daughter Bridgette got engaged and tried it on one night. It looked magnificent and it was in perfect condition—as good, and as white, as the day I wore it. I told Bridgette that she was welcome to use any part of the gown material for her own dream dress (although if the truth was known I would have been devastated at the thought of this exquisite dress being cut up completely). To my surprise and delight, one day Bridgette said that she would love to wear my dress, but maybe she would just alter the bodice to her personality and style. We both proceeded to put this process of altering the bodice by getting in contact with Judith from ‘Judith Penak Couture’. Bridgette explained to Judith what she wanted, and with Judith’s professionalism and expertise she developed my dream dress into Bridgette’s dream dress. 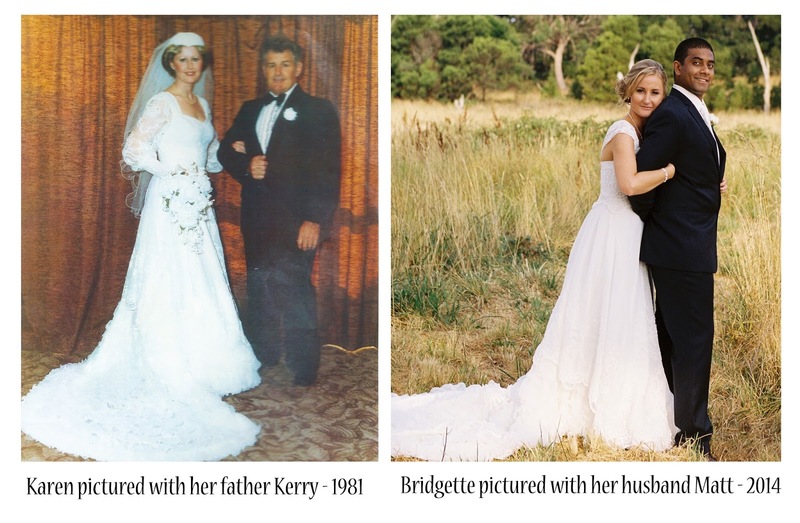 On the 15th February 2014, 33 years and six months later, Bridgette wore mine and her dream dress when she married. I couldn’t be more proud or thrilled that after all these years my classic dress has stood the test of time in quality and design, be it for a few alterations, and my beautiful eldest daughter Bridgette will walk down the aisle just as I did all those years ago and also look and felt like a princess. If you have a mums special bridal gown, visit our website to find out how we can help you!